Blame it on Houston’s Moon Tower Inn with their quirky menu featuring gourmet hotdogs: Venison and Blueberry, Lamb and Feta, Wild Boar and Roasted Jalapenos. These are some of the odd spins on the ballpark favourite causing a locally renewed interest in the hotdog. Another queue up at the airport, another food rag consumed. Apparently the hotdog trend I’ve seen locally has spread. 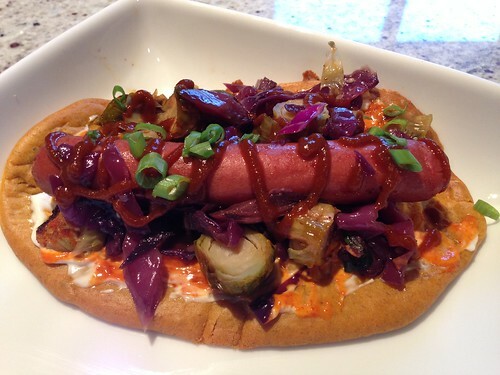 The article on hotdogs got me thinking about how to create a Korean version and with a gluten free bun. A good experiment with likeable outcome but with some changes for future versions. The components and assembly follow. Heat the oils over medium heat in a large saute pan. 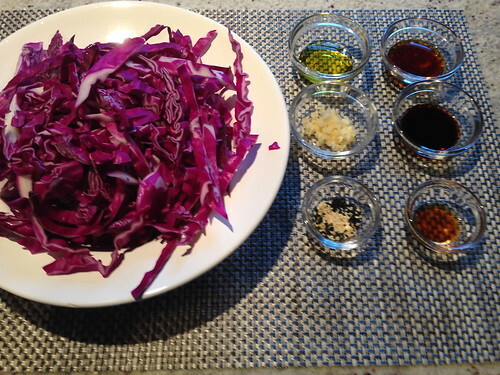 Add cabbage and saute for 5-7 minutes until it starts to soften. Add soy and fish sauce, stir, cover, reduce heat to low. 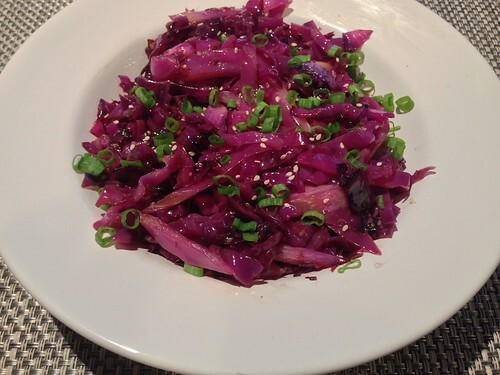 Simmer for 5-7 minutes or until the cabbage is the consistency you want. Remove from heat, uncover, add sesame seeds and green onion then stir to blend. Put in all in a Ziploc then shake until well coated. 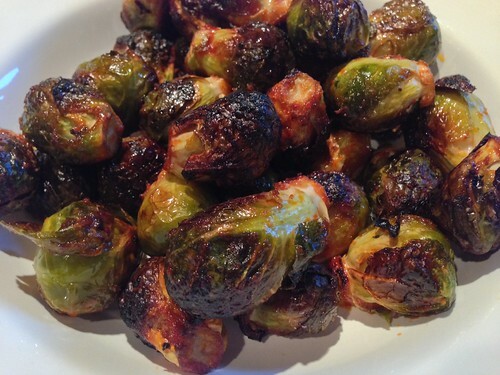 Pop it in a 425 oven for about 40 minutes or until the sprouts are as crispy you’d like. 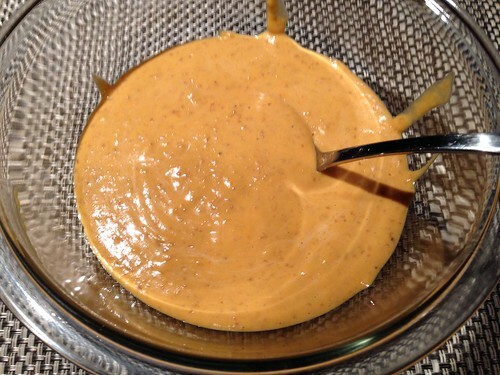 In a large bowl combine all ingredients until smooth. Let sit for a few minutes to thicken. On a parchment lined baking sheet, spoon the batter into oval shapes long and wide enough to hold a hotdog plus the toppings. As a guide, I made about 4 ‘buns’ and they were a little too small. Bake for about 25 minutes in a 350 degree oven. Alternatively, you could bake for 10 minutes, remove and cool. Place the partially cooked buns in a taco rack then pop them back into the oven for the remainder. I tried both techniques but the taco rack idea, albeit good on paper and a good visual, did not add much value since the super-fluffy bun went flat as it cooled. In either case, when the buns are done, remove to a cooling rack and let cool completely before using. Cook your favourite hotdog. I’ve tried a Hebrew National Beef Dog, a Garlic Chicken Sausage and a Tofu Dog with this recipe, the Hebrew National was the winner for its slimmer size and more beefy flavour which paired better with the gochujang, soy and fish sauce. On a bun spread a condiment of choice. Me, I used a little gochujang mayo (equal parts of gochujang and mayo). Place the hotdog and add toppings. 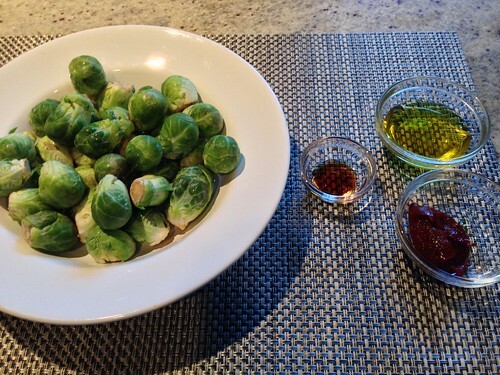 For toppings I used the soy-braised cabbage and slices of the gochujang roasted brussel sprouts. A little more gochujang and chopped kimchi to top. You’re not seeing a picture of the folded hotdog because when I tried that the whole lot disintegrated 🙂 Despite the bun erosion, the flavours and textures here are fantastic; a little heat from the gochujang, a little sweetness from the cabbage and sweet potato bun and a little salty from the soy and fish sauces. The bun is too soft and fluffy which unfortunately causes it to fall apart when adding any ‘saucy’ components. Next time less baking soda and a longer slumber in the oven. 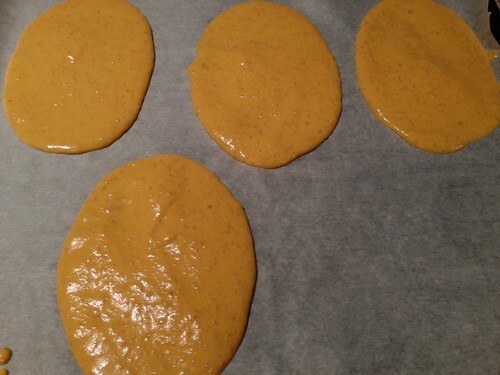 Either I need less toppings, more batter or need to spread the batter out more thinly since these buns were too small. 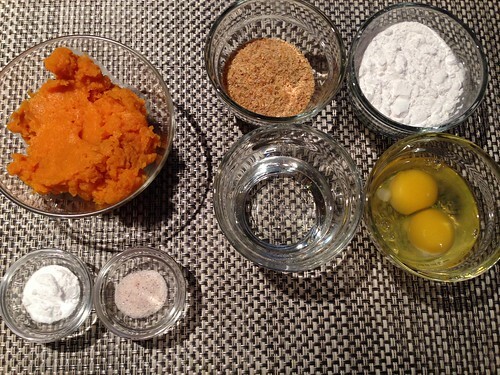 The sweet potato in the batter is a total win! The Hebrew National Beef dog was the best that I tried but next time I think I’m going to grill a batch of bulgogi instead. This entry was posted in Food, Korean and tagged Korean Dogs on August 15, 2016 by freetimeinhouston. Thanks! 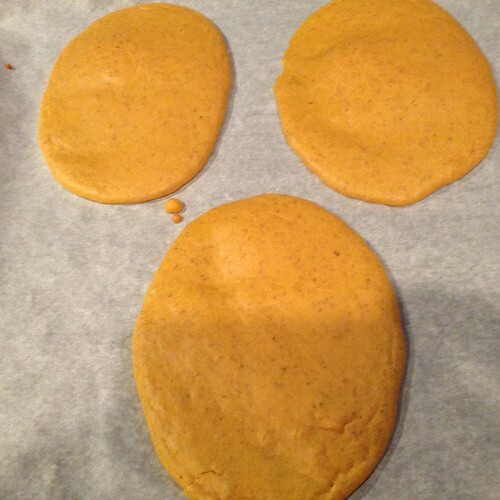 I suspect the sweet potato bun will become a staple in my house.